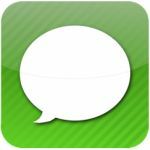 While the iOS 5 Notifications Center is arguably the biggest change to the mobile operating system, iMessage lets users send and receive unlimited instant messages to other users. While iMessage is essentially BBM (BlackBerry Messenger), the application is specific to Apple products running iOS 5. Like BBM, the messaging applications tells users whether recipients have read a sent message or are in the process of typing a response. The new feature allows group messaging as well as photo, video, and contact sharing. iMesssage is expected to put a dent into the thriving group messaging apps, including ‘AIM’ and ‘Campfire’. Of course, such applications have is the ability to send and receive instant messages to and from multiple operating systems. For now, Apple’s messages can only be sent to iPhone and iPad users. While FaceTime can only be used when connected via WiFi, iOS 5 users will be able to send messages and media over a WiFi or 3G connection with iMessage. Like BBM, there will be delivery and read receipts.